12 March 2014, at 1:59a.m. UK - John Homewood, an Oxfordshire farmer who developed a reputation as being ahead of his time in many aspects of farming, has died unexpectedly aged 84. Mr Homewood's vision of the future of farming helped to shape the growth of buying groups and grain marketing, while he also influenced the resurgence of traditional turkeys and geese for Christmas. The son of a carnation grower at Hampton, he studied horticulture at Reading University where he met his future wife Nancy whose family were farming at Peach Croft Farm at Radley. In the 1960s, he saw the need for farmers to strengthen their hand in purchasing supplies and he was a founder member of Abingdon Farmers buying group, now part of the Orion Farming Group. He was a great believer in cooperation in grain storage and marketing, becoming involved in founding Thames Valley Farmers which is now through mergers the national Openfield group. His father-in-law, Charles Taylor, began producing Christmas turkeys in the 1930s. By the 1980s, the traditional, hand-plucked turkey was facing stiff competition from cheaper frozen birds and Mr Homewood was one of the founders of the Traditional Farmfresh Turkey Association, which gained one of the UK’s first European protected food marks. 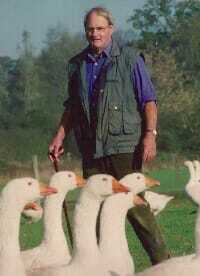 His wife started rearing geese in the early 1980s at a time when production was at all-time low ebb. With support from her husband, she became a founder of British Goose Producers, which has put the goose back on to the Christmas dinner table. Three times, they hosted its annual farm walk. Mr Homewood was also a local branch chairman of the National Farmers’ Union and also chairman of Drayton and District Farming Club. His life-long interest in horticulture led to production of strawberries, asparagus and a range of vegetables sold through the farm shop, which has become a popular venue for collecting Christmas poultry. In recent years, he became an enthusiastic collector of the local blue and white pottery, seen in the Abingdon Museum as well as during an exhibition on the farm last year. He was due to give a talk on the pottery on the day he died. He is survived by his widow, five children and eight grandchildren. The funeral service was held at St James parish church at Radley on 10 March.